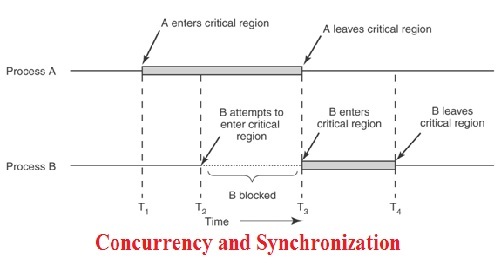 Concurrency is a property of systems which consist of computations that execute overlapped in time, which may permit the sharing of common resources between those overlapped computations. Concurrency is an issue even on uniprocessor machines. Synchronization is a mechanism that controls the order in which tasks execute. This can be done through cooperation or competition. Cooperation Synchronization is required between Tasks A and B when Task A must wait for Task B to complete some specific activity before Task A can continue its execution. Competition Synchronization is required between two tasks when both need some resource that cannot be simultaneously used. Students struggling with Concurrency and Synchronization and need help then you should visit assignmenthelp.net and get proper solution for their problem. We provide excellent online help services for all students from college and schools. Team of experts and professionals for Concurrency and Synchronization are always available to give you friendly online assistance to your problems.